Taco-Rice is a very popular Okinawan cuisine. Perfect for a quick and healthy meal. Looks beautiful with lots of veggies and goes great with rice! Enjoy!!! Cook ground beef and pork mixture in a frying pan. When the juice came out, add minced onion, and cook until tender. Add A and season with salt and pepper. 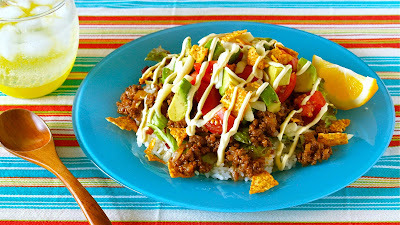 Place rice, lettuce, cooked Taco-Meat, tomato, avocado, cheese, mayonnaise, taco chips on a plate. Garnish with lemon wedge.